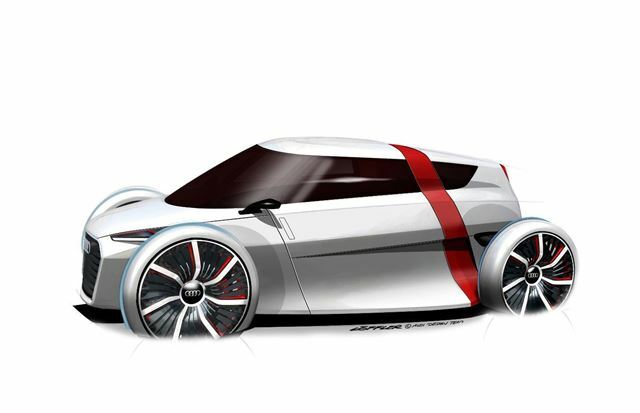 Audi has revealed a new compact electric city car concept. The ultra-light, super compact 1+1 city car is designed to combine elements of race car, roadster, city car and fun car into one new vehicle. The Audi Urban Concept has space for two, with a staggered design in which the passenger sits behind and slightly higher than the driver. The roof can be retracted to make the Urban Concept into a roadster. Carbon-fibre reinforced plastic, a lightweight material, is used in the construction of the cabin. The wheels are 'free standing,' outside the body of the car, much like a racing car. Propulsion for the 21-inch wheels comes from electric ‘e-tron’ motors linked to a lithium-ion battery. The Urban Concept is just that - a concept - but it does point at potential future Audi design and styling.